Tonight's episode of Food Network Challenge featured Fastest Foods. 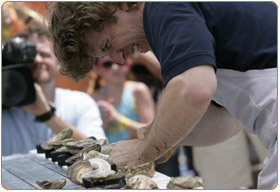 Among the head-to head-competitions was an attempt to shuck the most oysters in 1 minute. The Guinness World Record was on the line. The current Guinness World Record is 33 oysters in 1 minute. 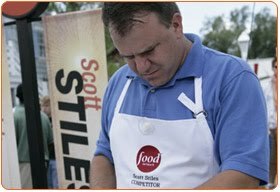 The contestants were Patrick McMurray and Scott Stiles. 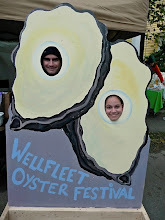 After time expired they each shucked 31 oysters. A good attempt at the record! Recently, McMurray set a world record when he separated 38 oysters from their shells in China. See World Record Academy for more information. But he doesn't just open oysters, he has written one of the best books on the market, and in my bookshelf, Consider the Oyster, and runs the famous Starfish Oyster Bed & Grill and The Ceili Cottage: Irish Local. -1996 - He opened two dozen more oysters than anyone else. How many oysters can you shuck in 1 minute?